Soutron’s web-based library management system engages users by providing self-service functionality, encourages collaboration and the capture of feedback and comments. It reduces the pressure on library staff and increases access to knowledge from any device including mobile smart phones and tablets. Fast cloud based and mobile friendly library management software. Soutron makes it possible for your Library System to be fully integrated with internal systems and part of a corporate information strategy. Soutron’s Library Management software is simple to learn and use, with fast navigation and intuitive forms. Every system we provide can be customised to meet the specific needs of your library and users. The features listed below explain some of the capabilities but the best way to understand the difference Soutron could make to your library is to book a personal demonstration with one of our expert consultants. You will find we have a keen eye for detail, ideas to advance thinking and will provide an honest assessment of the benefits waiting for you by making a change to Soutron Library Management Systems. Soutron’s Search Portal can be designed to your preferences. It is completely responsive, web and mobile friendly and can integrate third party feeds, links and search. If more than one portal is needed it is easy to arrange to deliver content to a separate audience – using a single database. The productivity of users is greatly improved using the Self Service options and tools within Soutron. Library staff, archivists and knowledge administrators all benefit from greater flexibility and simplicity of the work flows in Soutron. It is a hosted solution so you don’t need to worry about internal IT support or finding hardware or the resource to upgrade systems when new releases are issued. Soutron expert support services are “good” and “quick” and if you need to ask a question or find a solution to an issue, it is a personal voice at the end of the phone. Soutron is a true multi library, multi-country, global solution. Each office or location, department or country can be presented with tailored and specific information to their needs via their own search portal, easily configured and made so that the users associated with a country or office are directed to the right portal. Combine this with language and extensive customisation options and your system can be extended to all parts of your organisation. Enhance the search experience by applying a multilingual thesaurus (controlled vocabularies) that helps users find and cross reference information. Soutron incorporates the facility to create any number of thesauri, each with a full complement of built in term relationships as well as the facility to create custom fields within the thesaurus. Set up and configuration of the thesaurus is a simple task under the control of the administrator. Different policy settings on how it is used and applied can be made in each individual search portal. Metadata can be recorded and managed in a structured format using Record Templates. Each type of record / material can have its own fields and structure applied using simple forms and menus to make choices. The result is a Record that is entirely appropriate to the metadata that needs to be recorded or the digital assets that need to be uploaded and stored in the database. The control of a Record extends to how the record is grouped with other like records into a Content Type – a means of categorising materials so that searching and presentation of results is more secure and helpful to end users. Record templates can be set up with a wide variety of options to control how citations are displayed, RSS feeds provisioned, whether copies associated with a record can be applied and requested. Most organisations benefit from more than one portal. This is because users seek relevance and benefit from having information readily to hand to support their particular tasks. Thus users with different needs can be provided with content and links that are entirely appropriate and without the degree of “clutter” that otherwise is necessary when there is only a single OPAC. You can create portals for specialist subjects, or types of users, for departments or practice groups. Each one secure with restricted access to help support knowledge search and enquiries, image repositories and even portals for different offices. This is a great opportunity to share your knowledge and to help promote the services to users. Learn more about our Search Portal technology. Copy cataloguing is a feature that allows you to search for bibliographic records and select the right one to download into your database to form the basis of a new record. There are free resources that provide this service that Soutron connects to and we can provide connectors to others which may charge or require customisation to access and use. This is one of the ways in which time and effort can be saved. It’s simple and works with additional options that can be set in Soutron to automatically create the copy record with a bar code assigned dynamically for you to accession items into stock quickly and easily. Licence terms and copyright notices can be set up within Soutron so that when an item is accessed or the user wishes to download it, the system presents the appropriate licence terms for the user to acknowledge. This is recorded in the database and can be combined with controls set to permit download of documents and images. This can be extended further and full DRM applied to PDFs and eBooks that are being distributed. Librarians were the first to apply standards to textual data and the recording of metadata. These have evolved and a variety of standards now exist. Soutron has been designed to accommodate and allow whatever is preferred by the library or archive in managing their content. This is flexibly applied so that local preferences can be implemented and all via simple menus and forms so that the right content is being captured and standards of completeness and accuracy are maintained. Soutron’s Library Management Solution provides every function you would expect and more. Our database has been developed as a customised system to meet the individual needs of special libraries and we continue to add and build functions that are identified as necessary by our clients. Soutron Acquisitions has every facility that you want and need, create, amend, cancel and control receipt and budgeting in every way you need. This new module makes library work easier and faster with a friendlier and more forgiving user interface, making it easier to learn and use than any other comparable system. The engineering behind this system is world class, using the latest programming and web technology standards available today. Future-proofing your library automation system and bring productivity levels to new heights for library managers. The new system is faster, has fewer forms, needs fewer clicks with more functionality than the version it replaces. It’s the perfect solution for libraries under pressure to do more with less. View our video guide to Soutron Acquisitions and Serials workflows. 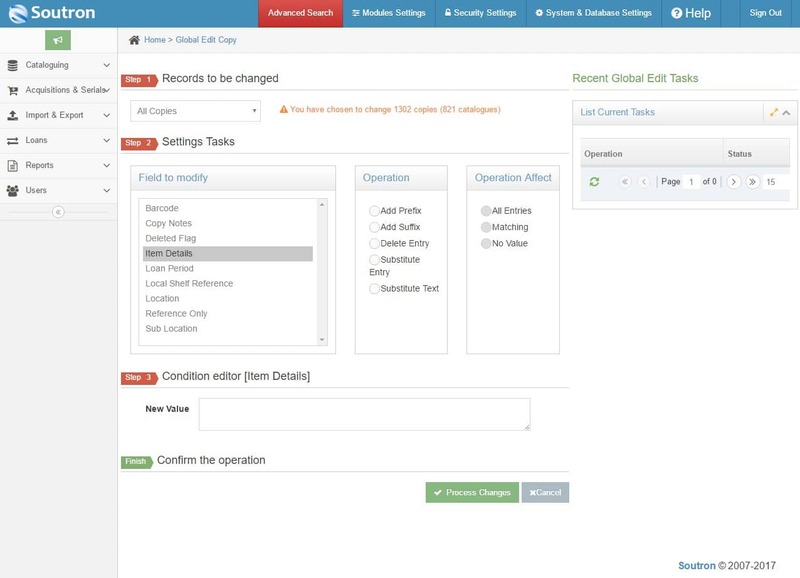 Data migration into Soutron is straightforward using built in import and global record edit and global copy functions. Data import can be in a variety of formats the most common being XML, MARC21 and CSV formats. Our software and metadata experts can help to clean data as part of the transfer process from an old system to the new one. This can include applying scripts to data to make transformations, setting relationships between data elements and records and building controlled vocabularies. Our goal is to help you to present your data in the best possible way for users to take advantage. Soutron is licenced to provide access to an unlimited number of administrative users and is also provided with unlimited search users. Our design philosophy has been to help the library engage other users both to search and to contribute into the database. To achieve this we provide enhanced licencing from the word go as a standard feature. This has the impact of encouraging greater use of the database, where more types of material can be confidently stored and made accessible. Users can securely add content in digital formats with the knowledge that it is secure and easily found. 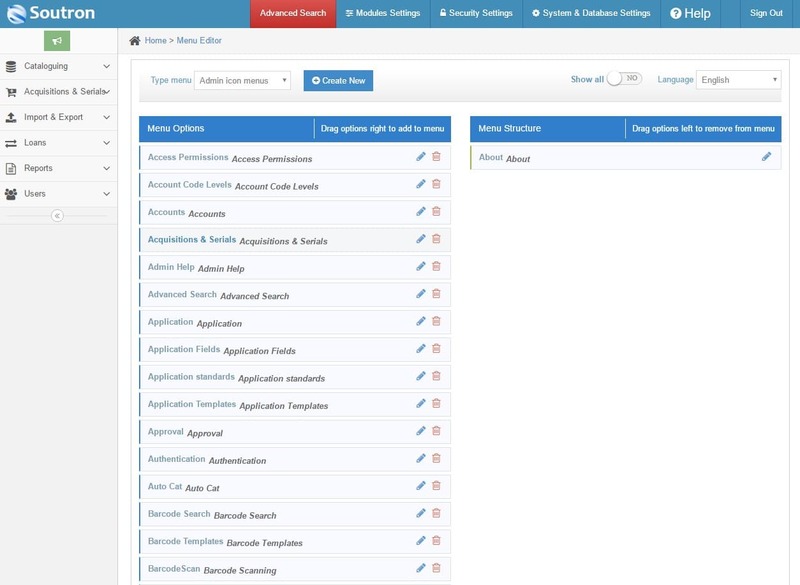 Access is controlled by applying flexible and granular security that control access through a combination of roles and permissions via search portals. The certain knowledge that access to your system is safe and secure is our priority. This starts with the management of a user file and the automated login procedures that we can effect to make access to your systems simple for end users. These objectives are achieved using a number of different methods and approaches, depending on the preferences of your Internal IT Service. Soutron is designed to work with Directory Services such as those managed via established protocols such as SAML, AD and ADFS. In addition we can build custom connections with in house systems or third party membership services to authenticate and provide a means to keep a user file updated. Helping users search your catalogue thanks to our predictive text search. This not only benefits end users, but also as a key feature within the administration area. Helping you find and access your information with ease. Self Service for end users is an essential requirement and Soutron meets this need by incorporating features such as Saved Search, Favourites, RSS Feeds and other My Account functions to simplify copy management and loans functions. This provides library staff with essential time saving and improves the end user experience. Where users are looking for help in identifying appropriate content, the library service can set up Reading Lists by topic or by a Course to aid self-development and support of CPD. If users are working on a research project, tools such as Collections (a folder based tool to allow items to be collected together and referenced in a folder structure) can be set up and applied. This helps users to collaborate with one another and to share content. A popular client feature that provides quick and easy access to your library catalogue directly from any web page or website, no matter what you use be it a CMS, WordPress, Joomla or a custom site. Soutron is multilingual by design. This means that it can be presented with menus in any language. Users can select their preferred language when using the system. In addition the database supports the UTF-8 Unicode characters for Cyrillic, Arabic, Chinese, Kanji and Western character sets. The range of management reports from Soutron is extensive and can be run by administrators at any time using parameters at run time to customise and tailor content to that which is needed. This supports the management of the library in demonstrating the extent of the use of content and the levels at which the library is supporting researchers and knowledge workers in the organisation. There are over 180 Management reports available and new reports can also be created and saved using the Ad Hoc Reporting Tool built into Soutron. Thanks to the latest in web-based online meeting software we can provide you with real time, interactive online training. However if you feel you would like face to face training, this can also be arranged to help you get the most from your new Library Management Software. Some people learn best on their own and we have a number of training videos that explain different functions and processes that describe how to use and apply the database capabilities within Soutron. Soutron is supported by a Help Desk based in the UK and USA and Canada. It is backed up with an On-line Portal, Community pages and Knowledgebase. We respond to email and have Live Chat but there is nothing like speaking to a real human being should you telephone directly! Library software in common with many applications is charged for on the basis of a restricted number of users on a cost tier basis, but not with Soutron. We are totally transparent in our fee structure. There are no hidden costs of the type that many organisations have found after having selected open source, thinking it was a “free” solution. Someone at some point has to fund software development, if it is to be relied upon. We provide it via a single annual fee that includes all software maintenance and support and hosting services. “Outstanding help desk support and transparency in all aspects” is our focus and goal. Contact us for a detailed discussion. Our staff are constantly on the go delivering programmes in various Commonwealth countries, a web based system really supports accessibility from whichever country they find themselves in. Ease of use and intuitiveness are big drivers; the system has to be straightforward because users want simple interfaces with simple search boxes that do a lot behind the scenes. Soutron continues to help us deliver our vision. Soutron is continually striving to bring innovation to libraries, especially in the end user experience to find information and to help extend the capability of the library to introduce new services. The way we design the Library Management tasks and workflows appeals to many librarians because of the savings and efficiency that can be achieved. Soutron’s systems architect is a corporate librarian with over 20 years’ experience in special library system design. He uses the practical experience of working with clients to guide changes and new developments. Within Soutron LMS, there can be any number of fields, record templates and content categories. Office documents and PDFs can be attached to records and indexing is immediate. Fields can be added as required and templates created for all types of content using menu driven functions. This means library staff can control their own applications and provide rapid access to content on behalf of others, setting security access permissions to restrict access or demand acknowledgement of copyright. This flexibility extends further. Relationships between data elements can be easily established to make the management and presentation of data more meaningful. This is particularly helpful in some applications where there is a hierarchy to the record structure as well as to terms within a subject index. This flexibility makes Soutron stand out from other systems. Considering a Smaller Library Solution? 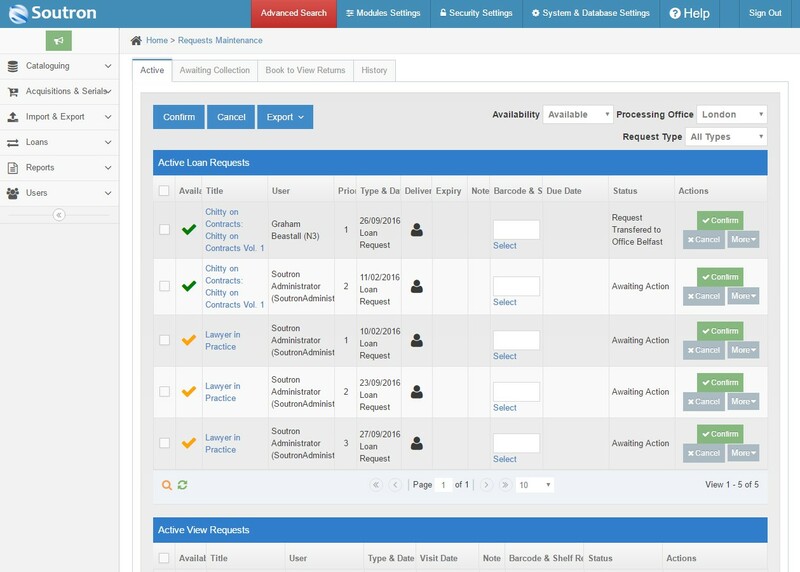 If Soutron LMS our flagship Library Management Solution is too much for your needs? You might be interested in taking a closer look at SoutronSOLO, perfectly designed with the solo librarian in mind.